Constructed from a highly durable 600 denier polyester fabric, this bag is practically designed a..
Reinforced nylon Comfortable carry handle 13 external pockets 8 internal pockets 8 tool l.. 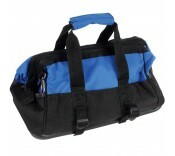 The 35 litre holdall bag is extremely popular and suitable for almost any task. It`s features i.. Ideal for workers, cyclists or school children who use highly reflective accessories to make them..